Christie Brinkley Reveals Anti-Aging Secret! Christie Brinkley reveals the perfect anti-aging secret for women using the Total Gym in the latest video for Total Gym Pulse. She states that one of the first things women notice as they get older is their upper arms. If not properly maintained they can become flabby causing women to be more self conscious and not able to wear some of their favorite sleeveless clothing. This is why the Total Gym is the perfect anti-ager for the arms according to Christie because you can do so many different exercises without ever having to pick up a dumbbell or change machines. Using the Total Gym is so simple sometimes by changing the position of your wrist you can affect the muscles being worked. Christie demonstrates several exercises that work the inside and outside of the arms especially the back area where most of the flab tends to gravitate. Even when resting in-between arm exercises she shows how you can work other parts of the body such as the waist. This makes the workout not only efficient – but fun at the same time. The brain needs exercise just like the rest of the body. Some studies have shown a reduced number of Alzheimer’s disease in women who are more educated. Keep your neurological pathways open by constantly challenge your brain by learning new things. Like any well balanced fitness plan what food one puts into their body is crucial in not only workout performance but day to day activities. Just like a car needs fuel to run, our bodies need food to stay energized. The higher quality of healthy food, the higher quality of level we operate. Getting less than six hours of sleep a night can significantly increase one’s risk for heart attack or stroke. Your brain can also start to deteriorate at a faster pace when not properly rested. Getting eight hours of sleep is extremely important for your physical recovery, emotional mood and longevity. We would like to thank Christie Brinkley for doing another amazing video for Total Gym and hope you use these great tips to stay healthy and feel younger longer. 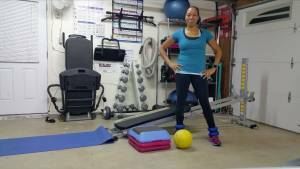 Be sure to watch for more workout videos from Christie coming soon to Total Gym Pulse. Here’s another great story on Christie and Sports Illustrated swimsuit models. Next PostMOVE with Christie Brinkley!